Over the past few months, I have started exploring the many possibilities offered by Digital Humanities technologies. Digital humanities ‘can be described as a set of conceptual and practical approaches to digital engagement with cultural materials’, as this excellent online resource from UCLA puts it. Another excellent resource for historians to learn more about digital tools and techniques is Adam Crymble’s ‘The Programming Historian.’ One of the things I find most fascinating is the use of Geographical Information Systems (GIS) to represent historical data. While keeping in mind that maps are always distorted in some way, entering historical data about events, people, and dates into a GIS application can visualize connections and networks that are otherwise difficult to grasp. Network visualization of 17th C correspondents discussing anatomy via E-Pistolarium project. 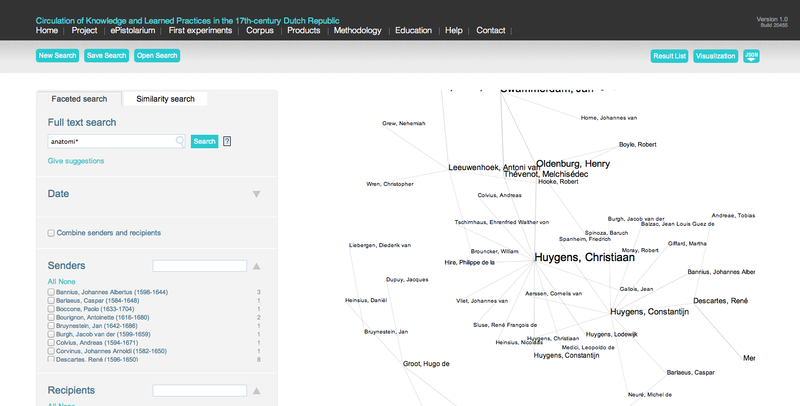 For example, the ‘Knowledge circulation in the 17th century’ project in the Netherlands gives insight not only in the content of correspondence of seventeenth-century philosophers, but also in the network it formed. Something similar is done in Stanford University’s ‘Republic of Letters’ project. There are countless other examples, but one thing many of these projects have in common is a substantial professional team of developers, creating the technical infrastructure that humanities researchers then fill with their data. However, there are possibilities for individual researchers without a big budget too. Many universities will offer their students and employees an online GIS course free of charge, and the development of open source software offers new opportunities. Here is an example of how a research group used open source application QGIS to create maps for their research on Burgundy’s historical landscape. 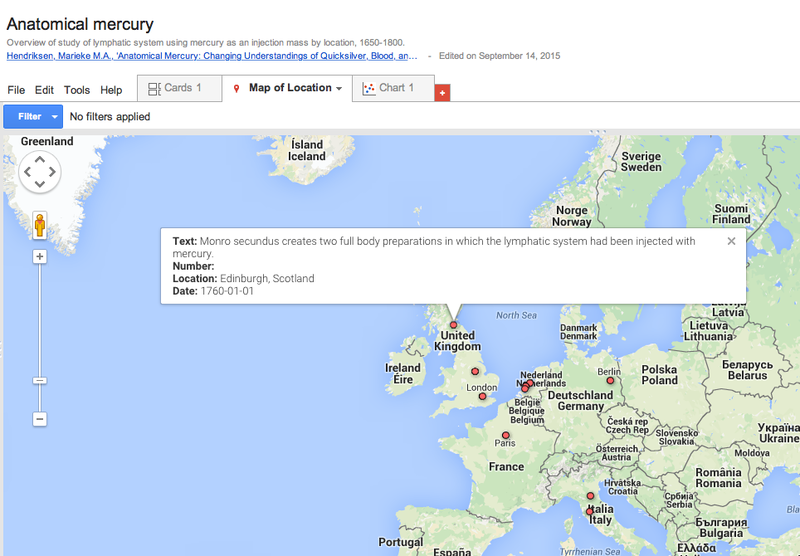 This resulted in an online map and a pie chart showing the geographical spread of experiments using mercury to trace the lymphatic system in the period 1650-1800. Even with this ridiculously small dataset, you get an overview that is impossible to obtain from the paper so fast. Of course, there is much to object: Google (for now at least) mainly contains contemporary maps, although historical imagery is being added as we speak. Moreover, I’m still trying to figure out if there is a way to connect datapoints and thus visualize interactions and networks in Fusion Tables. Used with such a small dataset the application only produces an interesting illustration – this did not provide any new insights. Still, this is only a first try. I have just installed QGIS and hope to use it to gain new insights from my research data in the near future. Do you already use digital humanities methods or GIS in your historical research? What are your experiences?